Peyote is a succulent, spineless cactus; a thick taproot produces the globular or top-shaped, dull bluish-green plant, which is 2 or 3 inches across and features from 7 to 13 vertical, more or less distinct ribs. One or more pale pink to white, funnelform flowers grow in the middle of the top, surrounded by long hair. The pinkish to red fruit is club-shaped and contains black seeds. Grows in the arid regions of southern Texas, Mexico, and Central America. The Shoshone name for peyote is Wogaybe. This is not eaten as fruit would be, but a tea is made from dried sections, and is drunk to induce visions. The standard peyote ritual among most Native American tribes still takes place in a tipi filled with the smell of sage, thyme, and burning logs. The ceremonial fire is situated between the horns of a crescent-shaped earthen mound. During the all-night meeting, the leader prays to the peyote, beseeching its help and asking that it produces no ill effects on the users. Still directing his remarks to the plant, he promises to pray to it again at midnight and again in the morning. 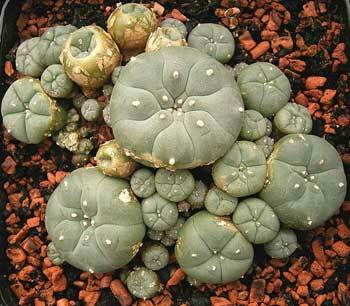 The number of peyote buttons eaten by each of the worshipers is generally four. After certain purifying ceremonies have been completed, a carved staff, special drum and gourd rattle are passed around as each participant sings four peyote songs. Various water ceremonies occur at midnight and dawn when there is a baptismal rite followed by a special ritual breakfast. The early Spanish missionaries protested against the use of peyote by the Native Americans and asked the penitent during the confessional if they had drunk peyote or given it to others to drink, in order to discover secrets, or to discover where stolen or lost articles were? The Aztec called the plant peyotl and ate the buttons ceremoniously either in the dried or green state. The Mescalero ate peyote to detect rival witchcraft, find lost or stolen objects, and to foresee the future. The Osage and Oto used it in their funeral meetings to communicate with the dead. In Mexico, the plant was employed for the purpose of prophesy or divination. It is well known that people who have tried peyote independently have not obtained the same noteworthy effects in the form of spiritual revelations, ecstasy, or clairvoyance that the Native American experiences through his peyote ritual. It is important to note that scientific testimony over the past 50 years has shown that peyote as used ceremoniously by the Native Americans never caused serious harm either morally, physically, or psychically. The primary use of peyote is to induce visions in a ritualistic or religious context, particularly in Native American tradition and, formally, in the Native American Church, a religion based on Native American practices. The hallucinogenic constituent of peyote is mescaline, an alkaloid which also acts to stimulate the heart and the respiratory system but has narcotic effects in higher doses. Mescal buttons are sun-dried pieces of the plant; 4 to 5 buttons (215 to 230 grains) are enough to induce visions. A session with peyote produces a loss of the sense of time, partial anesthesia, relaxation of the muscles, dilation of the pupils, a kaleidoscopic play of colors, and often nausea and vomiting. One Native American tribe used the root to treat scalp diseases and as a hair tonic. Use with extreme care, and only under medical supervision. If medical supervision is unavailable, at least use under the direction of someone familiar with peyote.